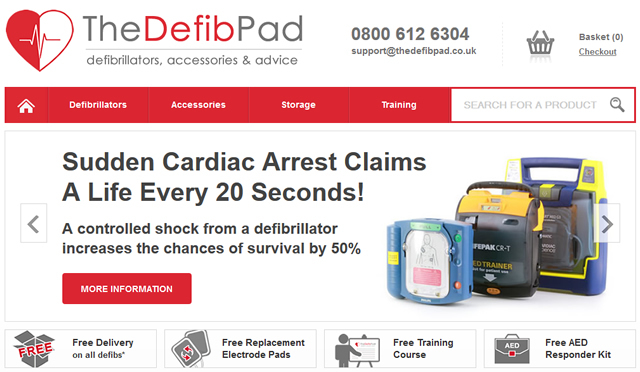 After months of preparation Safelincs has launched a specialist defibrillator portal called TheDefibPad. This new portal gives customers access to world leading brands and through our search refining system, makes selecting the best Defib for each application an easy and straight forward process. Our product ranges include semi and fully automatic defibs, defib cabinets, defibrillator training devices, first aid supplies and all replacement items such as batteries and pads. We like to stand out from the rest and unlike most suppliers of defibs we include FREE training, FREE replacement pads after two years, a FREE AED responder kit and FREE shipping with each defibrillator order.